Andrew “weev” Auernheimer is set to be released from federal prison, following a federal appeals court decision to reverse and vacate his conviction and sentence. “I’m going to prison for arithmetic,” Weev declared last March. Shortly after, he was incarcerated in the federal prison system, charged with violating the Computer Fraud and Abuse Act, the same law that federal prosecutors were invoking against the late Aaron Swartz — a close friend of weev. Auernheimer had been convicted of two consecutive five-year felonies. In 2010, Weev found that AT&T had failed to protect 114,000 email addresses of iPad owners. He passed part of the list off to Gawker. AT&T later apologized and explained the flaw and data leak. However, where AT&T downplayed its massive security breach, Weev went to prison and was convicted under an ancient computer law in the state of New Jersey. Today’s ruling by the Court of Appeals for the Third Circuit, not only overturns a lower court’s judgement, but also vacates the conviction. The three judges overseeing this appellate panel essentially sidestepped the hacking allegations and instead focused on the location of the trial. The appeals court found that the case should have been tried in Auernheimer’s home state of Arkansas since that’s where the alleged illegal activity took place. 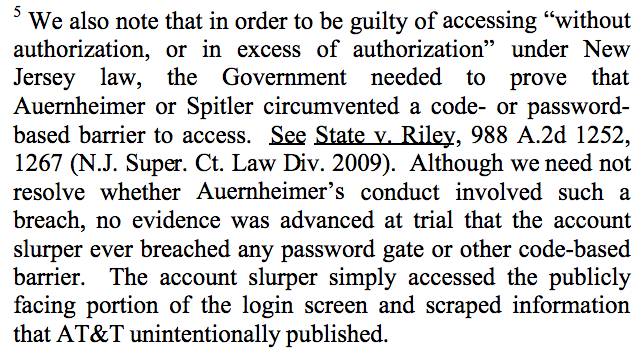 The original trial was held in New Jersey since that’s where the 4,500 email addresses that Weev leaked were from. The whole filing can be read here. The argument is concrete enough that it makes you wonder how the lower court managed to come to its decision in good faith. Hopefully the federal prison where he sat in solitary for months hasn’t beaten the zeal out of Weev.